Does Your Lounge Room Need a Little Improvement? Call TV Magic TV Wall Mounting in Pimlico Today! 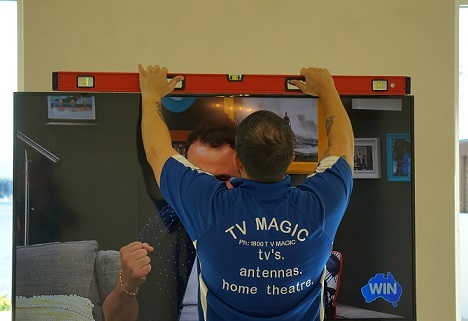 If your Lounge Room is starting to look a little drab, then maybe it's time for an upgrade by TV Magic in Pimlico. I'm your local T Magic Technician Gordon and I specialise in all things TV and Antenna. There are a whole range of benefits to getting your TV Wall Mounted. You can incorportate a Wall Mounted TV into to a Hom Cinema, you can use it as part of a feature wall or even have it doubling up as an artwork. For instance, Samsung Picture Frame TV's look just like an artwork by dispalying pictures on your wall when turned off at the power button. Amazing! Why is Wall Mounting a Better Option for Your Pimlico Home? Wall Mounting your TV is not only beneficial to the look of your Pimlico home and improving it's overall appearance, but there are also a number of practical reasons as to why having your TV Wall Mounted is going to be a far better idea in the long run. To begin with, Wall Mounted TV's are simply safer. You may or may not be aware that unanhcored TV's are responsible for a surprising amount of injuries to young children. This isn't a risk you want to take if you've got small children living in your home or coming to visit. Additionally, it is often the case that unanchored TV's have dangerous or unsightly cords dangling down from behind them. When we come out to Wall Mount your TV, we make sure that all of those unsightly cords are tucked away back into the wall where they won't cause any further trouble. Another common reason that people opt for having their TV Wall Mounted is that it just savs so much space. These days. you can just about have your whole entertainment system mounted on the wall, instead of taking up space and making your home look cluttered. So if you're looking for a quality TV solution, then call TV Magic Pimlico today!